A new instrument allows you to keep track of how well Bitrix24 is integrated into the daily work of your company on the whole and on a tool-by-tool basis. 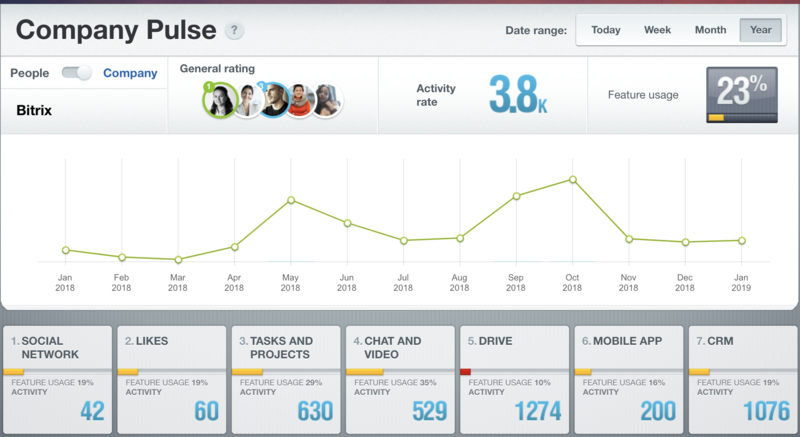 Company Pulse is an excellent tool for showing the effectiveness of your intranet and the level of adoption. This aesthetically pleasing design and highly functional addition to Bitrix24 provides a breakdown of use of conversations, tasks, likes, comments, etc. and compiles it into a usage rating. 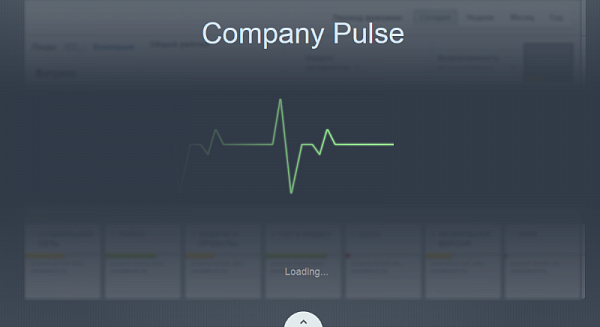 The Pulse shows data across the entire company or for individual employees. 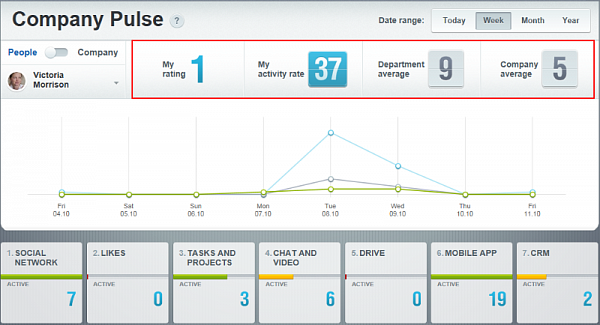 You can switch between the Company and People regimes and evaluate the activity rating of any employee. When using the People regime, all data is shown for an individually selected employee. That employee’s rating, activity index, and the average index for his or her department on the whole is shown. For example, the activity index shows the sum of various activities which the user has performed in the intranet using one of seven listed tools over a given period of time. For each indicator, there is an explanation available. Click the “?” for the full description of this indicator’s meaning. Additionally, you can choose a time period for which you want to receive data. It can be for the current day, week, month, or year. Further down, we see the individual pulse for employees – the activity of that particular employee for the given period compared with the activity rating of the company on the whole and his or her department. When working in the current day view, for example, the “Likes” tab will show how many likes have been set by the user for that period along with the average for the company and the user’s department. Depending on the chosen time period, the graph will show days or months. You can simple move the cursor across the graph and the individual data points will show up. Of course, most important is the bottom section, where all 7 main tools of the product are shown and you can see the rating on each individually. This section lets you assess the engagement of your workforce on a tool-by-tool basis over a given period. 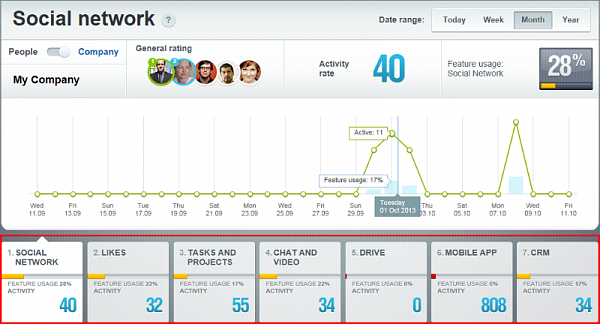 The numbers show the quantity of likes, tasks, IM messages, and the other main features in the product. 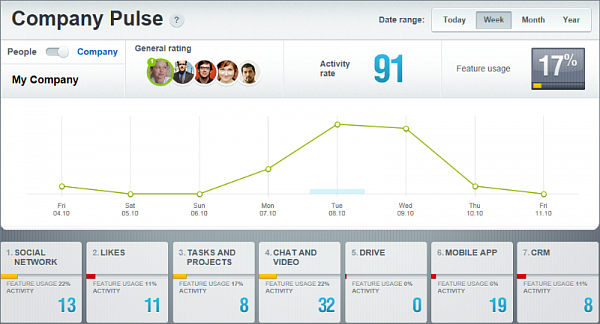 The Company mode helps you analyze the activity of your whole team and assess the ‘adoption rate’ of individual tools.